This weekend, my Palm Pilot decided to die. I have had it for almost four years, although I only started using it daily a year and a half ago. My Palm Pilot was a Palm III - from back when 3Com still owned Palm. It shipped with Palm Desktop 1.0, which was a big pain to use because it was not compatible with the then-new Mac OS 8.5. Of course, when I got my G4 I could no longer sync my Palm without buying an adapter, which I didn't do. On Sunday I turned it on, only to find that the screen would not accept my tapping of the stylus. It had been doing this on and off over the past couple weeks, but I just figured it was because either the stylus or screen was dirty. Obviously that was not the case, so I decided to hook my old cradle up to my Power Mac 7500 to see if I could backup the data that I had on the Palm. I remembered the long waits I had endured on the phone with 3Com to ask them why Palm Desktop 1.0 kept freezing on my Mac with OS 8.5, only to find out that it wasn't compatible --but a new version would be released "shortly." So I figured I might as well just download the latest version, which is currently version 4.0. The biggest features are Mac OS X and OS 9 compatibility. Palm Desktop 4.0 is a real pleasure to use. It installed quickly and runs very well on a 200 MHz 604e processor. I connected the cradle and pushed the HotSync button. Immediately the computer started synching my data. Then it proceeded to install an update to the OS, which I had never previously updated. Unfortunately that still didn't fix my screen problem, but at least I now had the data backed up. I am really impressed with Palm Desktop 4.0 for Mac. I love products that work the way they are intended, however very few seem to. Palm Desktop 4.0 really surprised me because not only did it do what I wanted it to do in a very timely manner, but it also had a very nice interface with excellent integration into Mac OS 9.1. You also can't beat the price - it's free. Even if you don't have a Palm, you can use Palm Desktop, and I highly recommend it. It's a cinch to use, too. There is a toolbar at the top that lists the memo pad documents, calendar, and contacts. Clicking on them will bring up the lists in a window below. The customizable colors make it even more fun to use. One of the best things about this application is that it is consistent and looks relatively similar in Mac OS X and OS 9, which is something I like. It eases the transition between the OSes, especially if you regularly use both systems. Palm Desktop 4.0 may replace my obsolete copy of Now Up-To-Date 3.6, dated 1996 - almost 7 years ago. Now-Up-To-Date was a very nice application. While it does not have as many features as Palm Desktop, it does have a nice interface that really looks like a wall calendar, a look that I like. You can also customize it to make it look like a desk calendar. It's also got a nice little feature where you can include pictures in with your To Do lists. One of the best things about it is that it runs quickly on any Power Mac. However, it's a little complicated to enter the data into the days. It's somewhat integrated with Now Contact, a contact management application, and comes with a set of utilities that offer an analog menu bar clock and alarms, which unfortunately don't work well with any system newer than 7.6.1 (Palm Desktop also has alarms). It does come with a very useful application for taking down quick notes called QuickPad (very good if someone calls while you are on the computer and want to get their phone number and name). You can also add a to do item or contact through this little application. Now-Up-To-Date does have a number of disadvantages. The toolbar buttons tend to be a little small and not clearly labeled. 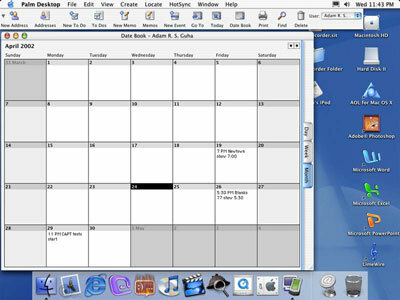 The interface is not exactly consistent, unless you are running it under System 7.x, since OS 8 and 9 try to apply their Platinum themes to the menus and windows in the application. The utility extensions are not consistently compatible with OS 8.1 through 8.6, and do not seem to work with a machine running OS 9. While Now-Up-to-Date 3.6 was a good application, but it is now out of date Palm Desktop offers the same features, and at a much better price (free). I think Palm Desktop just gained another user.